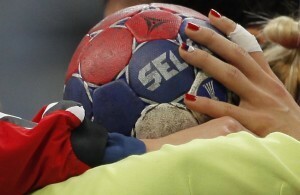 Home / News / IHF / CHAMPION GOES HOME: Serbian girls in the semi-finals! In the fantastic atmosphere in front of 16.000 fans in “Kombank Arena”, Serbia made the biggest surprise by beating Norway 28:25 (15:16). The beginning of the match was marked by the majestic Norwegian goalie Katrine Lunde. Two saves from seven-meter shoots from Lekic and Damnjanovic, as well as a series of attacks, allowed Norway to get some advantage quite rapidly, and the Serbian girls had a big problem with the realization even if the trio Lekic – Damnjanovic – Popovic functioned well. That led to the first time-out already in the 12th minute on the result 7:3 for the Scandinavian team. On the other hand, the other big problem was preventing Heidi Loke, the world’s best pivot, that used the empty space after the strong run in from their backs and increased the score. Jelena Popovic was substituted by Zivkovic, that brought some energy in the Serbian attack and after a goal of Andrea Lekic the difference was reduced from -5 to -3 (6:9) in the 19th minute. Boskovic was looking for players in a good mood, and put Nisavic on the left wing and Risovic on the goal. Katrin Lunde started the second halftime with great energy. There was nothing wrong with the Serbian attack that was fast and well organized, but the Norwegian goalie made the difference. The inefficiency in the attack effected the weaker defense that was outplayed again by Breivang and Loke. There was a Norwegian series of 4:0 to 20:15, but the first goal from Dragana Cvijic after seven minutes of the continuation, broke the barrier. There was a series of 5:0 for Serbia in nine minutes! The cold blooded Dragana Cvijic scored her first seven meters shot, and was the starting point to get back in the match to the 21:21 in the 48th minute when Hergeirson called for a minute break. Katarina Tomasevic kept on defending the Norwegian attacks. She saved a seven meter shot by Riegelhuth, followed by the first lead through Lekic, than Krpez for 23:21 in the 50th minute. Only after 12 minutes of break, Nora Mork found her way through the net of Tomasevic – 23:21. For the first time there was an advantage of +3 for Serbia, after another seven meter shot by Cvijic – 25:22 (53:52). The +4 was brought by Sanja Damnjanovic exactly six minutes before the end – 26:22. On the result 27:23 three and a half before the end. Hergeirson asked for a last time out. Sulland replied with a goal, but there was not enough strenght to overturn the result. “Kombank Arena” is on their feet, Serbia in in the semi finals! ← Previous Story POLISH SENSATION: France goes home! Next Story → 16.028 FANS IN “KOMBANK ARENA” – NEW WORLD RECORD! DREAM ABOUT SEMI-FINAL: Hungary or Brazil? 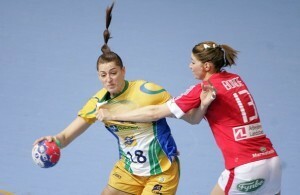 Great game for Serbian girls! Go for the gold!